It has been a long long time since I released a WordPress Theme. Finally, I have a new release — the Notepad theme. It is inspired by the iPhone’s Notes.app. This new theme is widget compatible with threaded comments, social media buttons, and multi-level dropdown menus. It has been tested on WordPress 2.9 with Firefox, Chrome, Safari, and IE7+. It also includes some nice CSS3 enhancement such as rounded corners and drop shadow. Preview the theme on the demo site. Very nice clean wordpress template, looks good. Awesome work! Simple and clean! Very Elegant! Thanks for this Nick. Great theme Nick. Very nice thanks share. Very great work mate, congrats! Cheers, very nice and clean, like it! Wow, absolutely beautiful! A very nice piece of work. Excellent work! Very clean design…it looks just like the note app icon. Gorgeous. Love the little details you’ve put into this. Any chance of getting the source files for customization? I’d like to use it for my personal blog. Thank you very much I will try to use it more. It should fit my web. Simple and beautiful!Thanx for sharing! Very nice, love the icons and attention to detail. Great post… Bookmakred + Subscribed to your RSS feed. Very cool! I love the clean look. And thumbs-up for fixing so quickly that minor problem with the hard-coded post date. Thanks a lot. This is stunning! Nice work. Definitely will recommend to every wordpress lovers/users I know. was a very good work. Really like this Nick La, great work. It creates a clean, natural looking website design which is based on sound typography and complimentary colour palettes. Cute icons too ☺ I’m really looking forward to pushing CSS3, the rounded corner functionality will be particularly useful in a lot of web design situations – If only IE6 could cope eh?! does it support Identicon or Wavatar or monsterID avatars? why the comment reply is not work? need adding plugin?? Wow! This one is reeeeeeally cute! One word, gorgeous! Great job! It’s really like Notepad for iPhone. Great job! Thank you for theme. i writing theme my site. thanks for the cool theme. good work. clean and nice, thanks. i will download it. thanks again. Great clean wp theme, Is it will be released on Woothemes? If you wish I could help you make it’s l10n and do the French translation. Please let me know. This is a beautiful theme. Thanks! I really like this theme and I think I’ll use it for my project’s temporary web site, with some subtle modifications. Thanks for sharing it! But I think it would use some typography improvements, e.g. make the text fit the lines better. I’ll share the results with you if I do it myself. One thing bothers me: why do you use the “Arial, Helvetica, sans-serif” font stack? If you want Arial – it’s a standard font on PC or Mac, thus putting Helvetica as the second one doesn’t make much sense. Moreover, Helvetica is a better font and Arial is usually used as a fallback, if Helvetica is unavailable. March 27-28 in Toronto, but I have to work and have school the day of your event or I would just stay a couple of extra days. IE6 is not supported. But I will use it because it’s so clear and pretty! Hello Nick La. I’ve been doing translation WordPress themes for Russian language – for Russian-speaking users, and intend to transfer your work. This would not conflict with your plans? (Fem Provider) 14-25 year college/school/model girls available 24 hours services. Nice theme. I think the theme is perfect for personal blog theme. Great work! http://blogturka.net Thank You! Very thanks. This share is very nice. nice template… like your work.. Thanks for sharing very nice information. I really like this blog. clean theme. I like the menu part. has anyone noticed that the widgets don’t work?? i added some to the footer and they are not showing up. and the widgets dashboard shows no widgets in the sidebar, yet the sidebar is full of widgets that came preinstalled in the theme. what is going on here??? 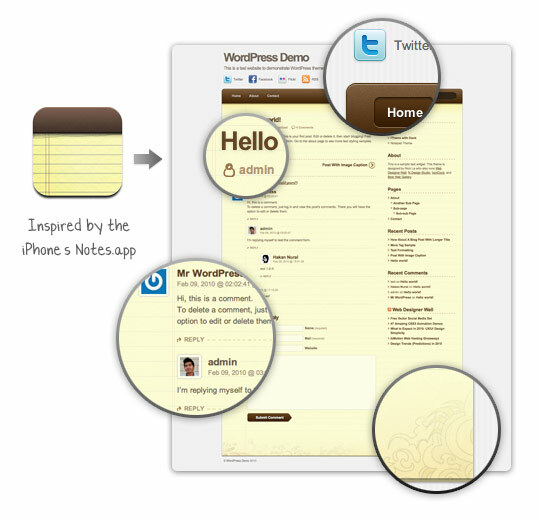 About iPhone Note App, this NotePad theme is very beautiful and useful. I will use this template soon.